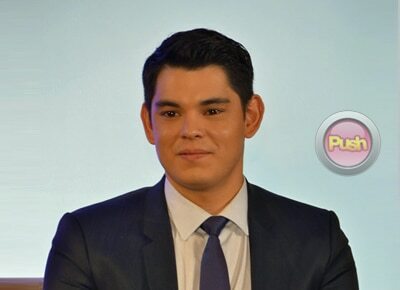 Richard Gutierrez openly admitted that he’s very thankful now that girlfriend Sarah Lahbati has buried the hatchet with GMA Films President Annette Gozon-Abrogar. "I was very happy and there's relief that finally they were able to forgive each other. Finally lahat ng pinagdaanan nila, ngayon tapos na," the 30-year-old actor said at a press conference for his family’s upcoming reality show titled It Takes Gutz to be a Gutierrez on E! According to the actor-host, his girlfriend had been wanting to start 2014 with a clean slate. "Matagal ng balikan sa court, nakakapagod and ang daming kaso. [There's] so much negative energy and we just want to start the year positive. Napag-usapan namin na kung pwedeng tapusin yung problema, tapusin na para pareho kaming mapayapa at makapag trabaho na," he said. Early last year, Lahbati claimed that "under the table" deals had been happening between the GMA Artist Center and Icons Management which thereby led to her filing of four cases against Abrogar. These charges were however junked by the Quezon City Prosecutor's Office, while Abrogar on her part also filed a libel case against her. Months later, both camps settled their differences with Abrogar withdrawing her charge and Lahbati withdrawing her petition for review. With both of them starting fresh with their respective careers, as Richard decided to be a freelancer and Sarah transferred to another network, could it mean that they are finally ready to settle down? “Alam mo, ang dami naming… ang dami pa naming pinag-iisipan ngayon. Ang dami pa naming mga bagay na pina-prioritize, yun nga, gaya ng mga cases ni Sarah na natapos na. Isang malaking relief yun para sa relationship namin. So, one step at a time,” he emphasized. The son of actors Annabelle Rama and Eddie Gutierrez played it coy when asked if he and Sarah already tied the knot secretly and if he plans to propose to her within the year. “Tingnan natin, I can’t answer that. Baka paggising ko, iba na ang desisyon ko!” he said laughing. While he remains evasive about plans, Richard was firm in claiming that he sees a bright future with the young actress. “Siyempre. I can’t be with her naman if I don’t see myself with her in the long run. And kami nga ni Sarah, medyo tried and tested na rin ang relationship namin after what we’ve been through. So, strong ‘yung relationship namin,” Richard explained. Since she’s also “part of their family,” Richard assured that the public would see a lot of Sarah as well as his private life on their upcoming reality show. While his mother and sister Ruffa Gutierrez expressed excitement over them making a history as the first Asian family to have a reality show, the younger Gutierrez didn’t deny that he was actually hesitant to be part of it in the beginning. It Takes Gutz to be a Gutierrez Premieres on E! on June 1, 2014 Sunday 9 pm.